More than just a charging dock, the NuDock smartphone docking station also turns your phone into a computer. Today’s smartphones carry a great deal of information and entertainment that is not always easy to access by other devices. To end that limitation, the NuDock offers a range of ports that drastically increase the phone’s connectivity. 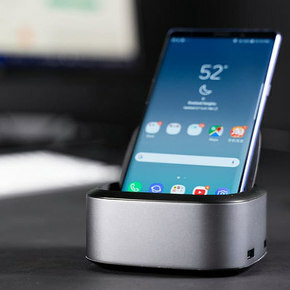 Connection additions include a game controller, hard drive, projector and mouse, and the dock itself holds the phone at the optimal angle for viewing. What’s going on in MR-glasses? With similar gadgets people could read virtual magazines on a table and solve crosswords with a stick.